Sign up and enter your favorite sweepstakes giveaway for some of the hottest selling items online right now! Every minute that you hesitate to take action means you could be passing up the opportunity to win! 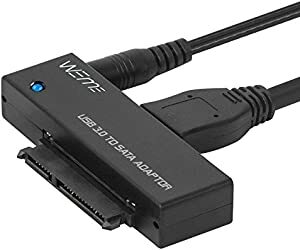 WEme USB 3.0 to SATA Converter Adapter for 2.5/3.5 inch Hard Drive Disk SSD HDD, Power Adapter and USB 3.0 Cable included. Chance of winning: 1:1300. There will be 2 winners. Brought to you by Amazon and WEme +.